Liberty from what? 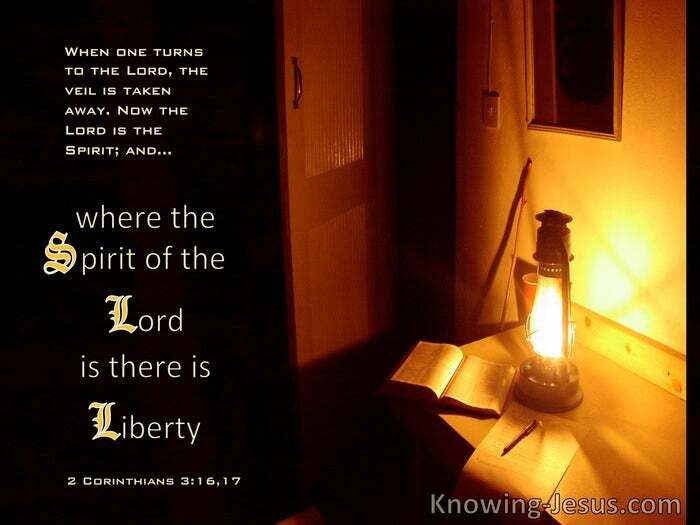 Well, if we turn to the Lord, and are occupied with Him in the way we have indicated, the Holy Spirit sets us free. It may be you are struggling, striving, fighting, wrestling, praying, pleading, longing, yearning, asking the Lord to set you free from condemnation, free from fear, from those paralyzing bonds in which Israel was when the glory appeared. Do you want to be free from fear, from dread, from terror, from condemnation? What are you doing to get free? 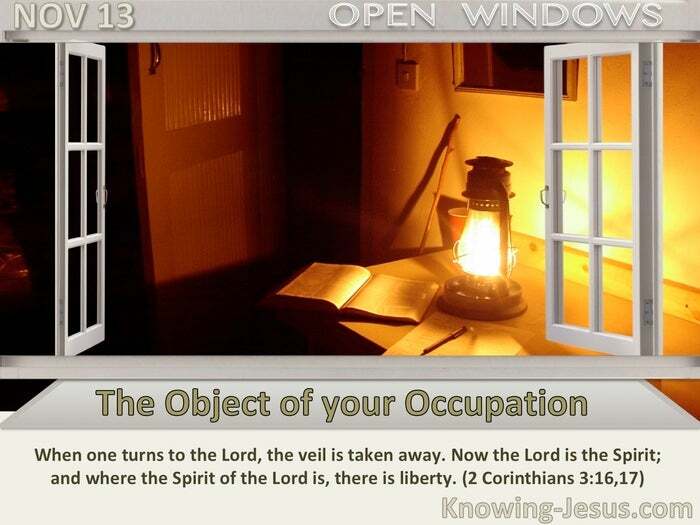 There is one simple, direct way, namely, to be occupied with the Lord, to turn to the Lord. Get Christ as God's satisfaction in your view, and cease trying to satisfy God yourself. Faith in Christ is all God's requirement. How deeply true were His words, "Apart from Me ye can do nothing." "Abide in Me. As the branch cannot bear fruit of itself except it abide in the vine; no more can ye, except ye abide in Me." That is only figurative language, which means be occupied with Him, set your mind on Him, dwell in Him, rest in Him, abide in Him; or, as Paul would say, "Gaze on Him, behold Him," let Him be the object of your occupation, and the Spirit will make you free. More than that, this beholding of Christ means that the Holy Spirit changes you into God's likeness: "Beholding... we are changed." It is not said, "Behold, we begin to change ourselves," and we embark upon self-transformation with all its struggle, and conflict, and battle. We are changed by the Lord the Spirit. Be occupied with Christ, and the Spirit takes up the matter of transforming into His image. Be occupied with yourself, and you will see that the law of conformity to type operates. If you are the type, then you will conform to that type. If Christ is the type, then the Holy Spirit will conform you to His likeness. Then this being occupied with Christ means that the Holy Spirit makes us sufficient as ministers of a new covenant. I do not think that ministry is such an onerous thing after all. We need to come back to the simplicity and the spontaneity of ministry. Be occupied with Christ, and the Holy Spirit will show you more and more in Christ with what to be occupied, and as He makes that livingly real, you will have something to give to others.